In this week’s Balls of Steel Goes Into the Writing Room and Behind the Lines with DR, I finally spill the beans of why I was in Los Angeles last week. Our passion project, the narrative adaptation of the Pulitzer Prize-winning book, Slavery by Another Name, has finally found champions! We are honored to have Doug Richardson, screenwriter of such hits as Die Hard 2, Bad Boys and Hostage, and Tom Schulman, Oscar-winning screenwriter of Dead Poets Society, onboard as producers. Douglas A. Blackmon, author of the book, and I have been working on this script for four years now. We are thrilled to see where this new direction takes us. Regardless of how it ultimately turns out, every step of this journey has brought new lessons to both our professional and personal lives. We’re just going to enjoy the ride. 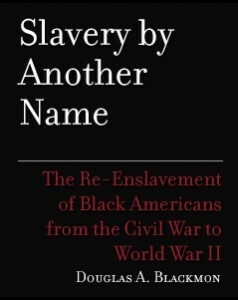 The most shocking book I read last year was “Slavery by Another Name: The Re-Enslavement of Black Americans From the Civil War to World War II,” by Douglas Blackmon. I hadn’t heard of it when I picked it up even though it won the Pulitzer Prize a couple of years ago, so I was doubly shocked by the story it tells. Let’s hope she gets to see it on the big screen too. In the meantime, watch the PBS documentary of Slavery by Another Name, which also appeared at the Sundance Film Festival in 2012. Thank you all for your incredible support these past years and joining us as we continue to pursue bringing our nation’s true history to a new audience. This entry was posted in Blog, Screenwriting Craft, Slavery by Another Name, Writing and tagged doug richardson, douglas blackmon, jeanne veillette bowerman, pulitzer prize, tom schulman by Jeanne Veillette Bowerman. Bookmark the permalink. Congrats Jeanne! It’s great to see all of your hard work paying off. Inspiring stuff.